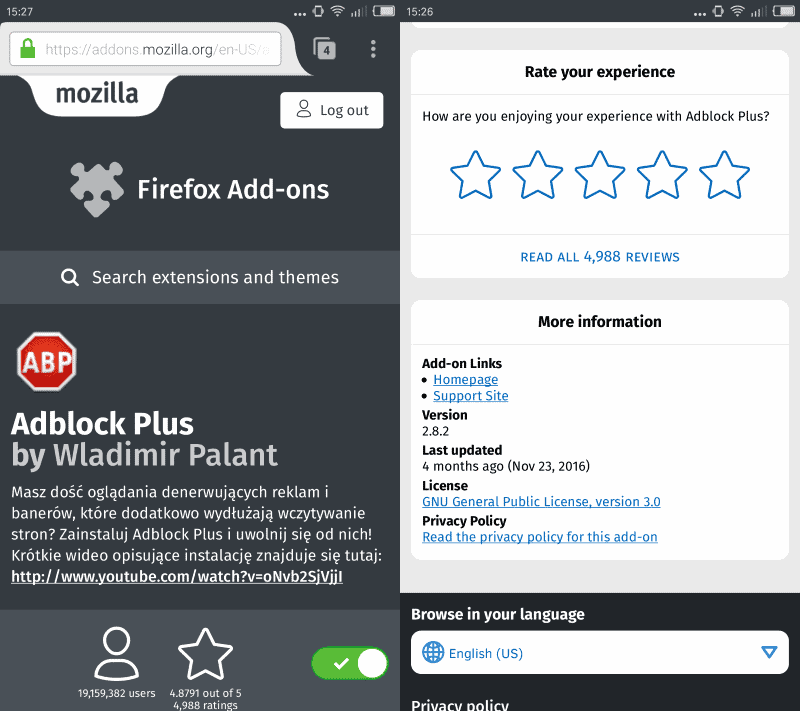 Where are those Anonymous Firefox add-on ratings coming from? 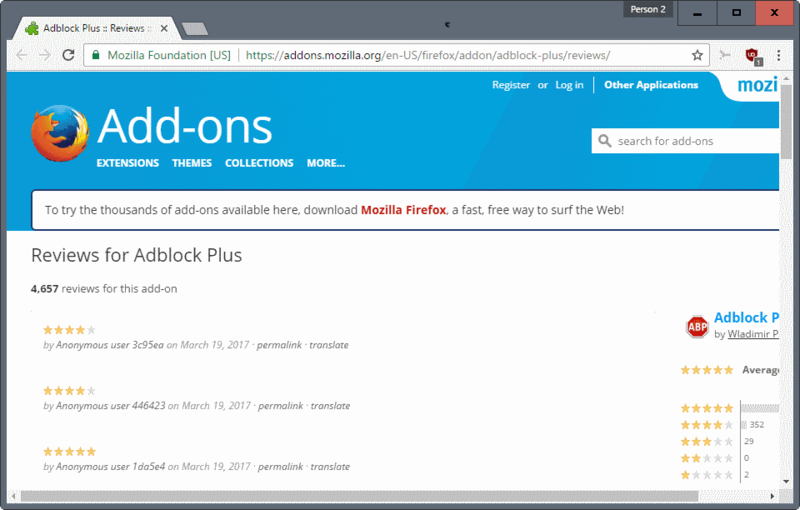 If you are a Firefox user and pay attention to user reviews and ratings on the Firefox add-ons website, you may have noticed an increase in anonymous ratings. The ratings are left by anonymous user "random six character string", and only have a rating but no review itself. This in itself is strange for veteran Firefox users, considering that one of the requirements for leaving reviews was leaving a comment up until now. One example where you can see the new influx of reviews is the Adblock Plus reviews page on Mozilla AMO. As you can see on the screenshot above, the first three ratings have been left by anonymous users. You can click on the username to find out more about that user. No matter how many you check, you will notice that they have all been created on the same day the rating was left. So where are those anonymous user accounts coming from? Webmasters may have seen similar activities by anonymous and random users leaving comments on sites, and one fear that users and add-on authors may have that this is a spam campaign. The first thing that comes to mind is spam, probably because of that. This is not the case however. According to this discussion on Mozilla's official Add-ons forum, anonymous ratings come from users who run Firefox mobile. This is because the new mobile site was recently launched. You can test it yourself by visiting AMO on a mobile device, or scrolling to the bottom of the page and clicking on "View Mobile Site". You'll notice the new rating UI lets you submit a star rating without a written review. This is intentional. We think this will encourage more people to rate add-ons, and will reduce the instances of written reviews that don't say much or end up being deleted because of the way they're worded. This is confirmed on the Mozilla Addons Server Github page. It confirms that blank reviews will come to the desktop site as well. We're supporting blank reviews now. The recent ones come from the mobile site, which is the first one to support this. The desktop site will support it in the future as well. Firefox users on mobile devices still need a Firefox account to leave reviews, but the requirement for leaving a comment / explanation has been removed by Mozilla. It is unclear why Mozilla's site shows these ratings as anonymous, as opposed to listing the Firefox account username. One explanation may be that you only need to set an email address and password during registration, so that there is no username for a particular user at that point in time. As far as I see it, there are two issues with these reviews. First, that they look like spam, and second, that they don't add any value besides adding a rating. Mozilla's main idea behind lifting the requirement to leave a comment when rating an add-on is that it does away with meaningless reviews by users who did not want to write anything but still rate an add-on. The fact that these are now replaced by empty reviews that clutter the review listing refutes that argument. It would be easy enough to solve part of the issue right away though, as Mozilla would only have to find a way to remove empty reviews from the reviews listing. Now You: Do you read reviews before you install add-ons? Find out where anonymous user reviews and ratings listed on the official Mozilla Firefox Add-on repository are coming from. This looks like the usual Mozilla screw up..
No requirements might just help to increase your own ratings, or decrease similiar addons ones, unless they took some precautions, something I’m not sure of. Alsso, what’s the point of encouraging no-words reviews because of “instances of written reviews that don’t say much”? I’d rather see fewer, with some more detailed reviews, than an enormous amount of star ratings only that might mean everything and nothing. Sorry but this will make me shy away from an extension. I am leery of extensions whose accounts are anonymous and have 4 or 5 stars. I have seen reviews on Chrome store of particular extension which seem to indicate that there are bots out there stuffing the reviews. When I see similar behavior on Mozilla side I also steer away from those extensions. I always read the reviews. Reading them helps me to dismiss the fanboys/girls and one word “super, great, wonderful” comments. The more in depth comments allow me to assess how good or bad the add-on is. Anonymous star ratings are pointless and I will not install an add-on rated in this way no matter how good it might be. It’s yet another instance of Mozilla using impeccable logic while ignoring important factors, thereby making a conveniently justified big mistake. It’s in the end, a pseudo-scientific road to hell. The end of Firefox as anything worth thinking about seems to be approaching fast and it’s very sad. It is the N̲E̲X̲T̲ ̲S̲T̲E̲P̲ for ̲M̲o̲z̲a̲r̲e̲l̲l̲a̲ trying to copy not only Chrome but also the C̲h̲r̲o̲m̲e̲ ̲W̲e̲b̲ ̲S̲t̲o̲r̲e̲ so it have to become C̲R̲A̲P̲P̲Y̲. Next Step will be to allow lot of C̲r̲a̲p̲W̲a̲r̲e̲ with A̲d̲w̲a̲r̲e̲ and A̲d̲v̲e̲r̲t̲i̲s̲e̲m̲e̲n̲t̲s̲ inside Addons. Blank comments are appropriate. Many extensions will be rendered obsolete when Mozilla releases FF v57. And so, the extension site will become nothing more than a graveyard for what used to be the best part of FF. It is best to just let Mozilla fade away. Reviews with only a rating and no words are meaningless, whatever the product or context. On Amazon, there is a particular subset of reviewers, legitimate but stupid, who write a review just in order to complain that Amazon has this very, very light requirement of asking for a minimal length. In other words, you can’t only give a product a certain number of stars, but you can’t either just say : great ! or : rotten ! or even : definitely average ! You’ve got to actually say something and help your fellow buyers. But the rule is very accomodating : two or three lines of text are probably enough to reach the threshold. Nevertheless, instead of just shutting up (always an option), this particular demographic takes pain to “contribute”, fill up their “review” with buffer characters — and complain about the rule. Regarding Mozilla’s new policy, this is one more step on the path of dumbing down. More “ratings”, more “views” are good, whatever the contents. Once upon a time, “empowering” the user was the buzzword. We’ve come a long way since. Swell idea : in order to curb reviews that don’t say much, let’s allow reviews that don’t say anything at all. Text-less “reviews” immediately raise the suspicion of foul play : if they are good, they are suspected to come from friends of the developer stuffing the ballot box. And if they are bad, they look as if they were fakes from the competition. Of course reviews are useful, when the review space is well curated. This is the case with Amazon. Amazon has some incredible reviewers, and even the reviews which can be spotted as promotional are good, and useful. This is the case for books : all major books on Amazon have at least one obviously promotional review, but that’s all right. When you buy books, you are literate, therefore you can discriminate. Everybody reads the back cover before buying a book ; nobody expects to read there that the author is an ignorant scoundrel spewing nonsense. Many Amazon reviews are of course average, but, taken as a whole, they offer an incredible amount of knowledge and experience. Much more than many “reviews” written by so-called journalists in the media. Mozilla is stupidly degrading its brand by allowing worthless reviews to taint Firefox’s image, just in order to pump up some irrelevant numbers. Since, according to Mozilla, relatively few users install add-ons, why would they bother to make a meaningless change to allow pointless comments (or whatever they want to call them). This is definitely a mistake. It’s hard enough wading through reviews on the Play Store for Android, but at least, they require a real account. Anonymous reviews are just going to inflate or deflate ratings for certain extensions that have fanboys or trolls. Well spotted that all the posts were made on the same day ! Seriously though, why didn’t the Site Moderator spot this ? Poor site management. yes, i reported that user myself before i did post it here. but of course i don’t know if his “ratings” got deleted because of the report or something else. I just don’t trust any online ‘reviews’ any longer, whether it’s Mozilla, Google, Amazon, Android Play Store or whatever. Even TripAdvisor is a crock these days – and in this I speak from very direct personal experience. It’s not that all the reviews shown by these services are fraudulent – it’s that the service providers themselves just don’t put enough effort into filtering. I’ve seen reviews so obviously dodgy, they were laughable – if we can spot them, why can’t the moderators? It makes choice a lot more problematic, but it doesn’t take above a half-hour’s reading of all these review services to become intensely suspicious. I’ve always believed a review was far more important than the rating, that the rating’s only purpose is to resume an argument, that a meaningless argument was better than no argument at all. I still believe that if there is nonsense it is in the scoring which can be an invitation to perceive one’s liberty to express an opinion as an opportunity to deploy one’s capacity to flatter or destroy rather than to resume an explanation. Scoring is absurd, participates to intellectual laziness and is indeed meaningless if there is no argument behind. Allowing blank reviews is, IMO, totally insane. If we want a civilized and educated user’s participation to an add-on’s image it is scoring which should be abandoned and a user’s only comment accepted. I believe Mozilla’s decision to do exactly the opposite is fundamentally stupid unless it be a deliberate call to an uneducated participation. In the same way democracy would consider education as a minor problematic given the fact everyone can vote. Would vote only those who can explain their vote that less votes would nevertheless be far more pertinent. Same on AMO. We live in a world which looks at scores and forgets dialectics. Insane. Thanks for the article, I thought they were bots. Among so many empty reviews it makes whoever wanting to write something feel like a freak. I wonder if Waterfox could have its own separated addons site. At this point, Mozilla may remove addons ratings and reviews totally because these just turned to be meaningless. I think they are trying to create exact copy of Google Chrome so that users will get used to Chrome interface. Eventually they will sell Firefox to Google. Do you read reviews before you install add-ons? Depending of the add-ons’ authors. On the Adblock Plus page, “bad” reviews with “bad” ratings are systematically removed since long time… so imo having chosen as example ABP to document this article is a farce. Sorry that this blog has upset you. I recommend a lie down in a dark, quiet, room until you recover. With a fine transcendental meditation melody hope for a quick recovery is reasonable. Otherwise a massage may help (yes, even if the masseur is ugly). Sauna, pool and above all a healthy life, no bad stuff, not too much meat (think vegetarian), striving for reasonable ideals will all contribute to an enlightened path towards the world of Zen. If I had not been zen, you would not have done humor both. What’s next,thumbs up,thumbs down like Netflix did with it’s site,Jesus Christ Mozilla what are you doing to your awesome addons and devs that put really hard work and passion,we all have to become Chrome ”slaves”;not cool,not cool at all! Why not do something similar to Amazon and totalize the number of 3 star, 4 star, etc reviews and just have one handy chart.